Jean Cocteau labeled this revolutionary work "a pastorale of the prehistoric world" at its premiere in Paris in 1913, when interest in primitivism was at its zenith among the avant-garde. These "Scenes of Pagan Russia" did indeed inspire primitive reactions among their opening night audience, who were so vociferous in their protests that the dancers could scarcely hear the music. Yet this powerful work, with its novel rhythms and hitherto unheard-of chordal combinations and orchestral effects would change forever the elements of musical language and exert an enormous influence on three generations of composers. Once a scandal, it is now perhaps the most famous orchestral work of the twentieth century. It is reprinted here from the full-score Russian edition published in 1965. 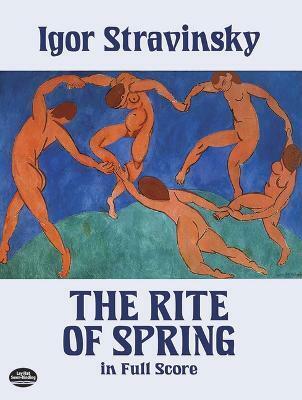 Like Stravinsky's scores for The Firebird and Petrushka, The Rite of Spring was commissioned by Serge Diaghilev for the Ballets Russes. Choreographed by Nijinsky, it is still a favorite of ballet audiences, and the score is one of the most performed and recorded modern works in the orchestral repertoire. Now music lovers can enjoy every note of this brilliant and stirring landmark of twentieth-century music, faithfully reproduced in this inexpensive, high-quality edition -- ideal for study and for following both live and recorded performances. Like Stravinsky's scores for The Firebird and Petrushka, The Rite of Spring was commissioned by Serge Diaghilev for the Ballets Russes. Choreographed by Nijinsky, it is still a favorite of ballet audiences, and the score is one of the most performed and recorded modern works in the orchestral repertoire. Now music lovers can enjoy every note of this brilliant and stirring landmark of twentieth-century music, faithfully reproduced in this inexpensive, high-quality edition--ideal for study and for following both live and recorded performances.